A set of missing teeth can be a constant source of embarrassment. For many people, you cannot enjoy the light moments comfortably even if you want to laugh your lungs out. Even more, it denies you an opportunity to give that genuine smile. Thanks, dental implants innovation, you can now get a permanent replacement for that missing teeth. At Smile LA Downtown Modern Dentistry, we offer amazing dental implants Los Angeles services. Our dental experts have extensive training on the same. The least you can expect from us, therefore, is an awesome experience. In essence, dental implants are titanium carefully inserted in the jaw. Here, they act as permanent, strong anchors for the new set of teeth. Ideally, they offer patients maximum comfort and restores functionality to the affected tooth. Even more, they enhance oral aesthetics as they are similar to the natural teeth. 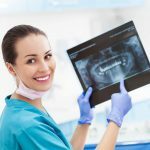 Before proceeding with any dental implant procedure, our professionals always consider a number of factors. Normally, we offer dental implants services to patients missing a single tooth, a set of teeth or all the teeth. For patients missing all their teeth, either on the lower or upper jaw, we will install a complete set of implants. Most patients who wear complete dentures often complete of loose dentures. Such people can benefit significantly from implants. Remember, implants have the ability to reduce the mobility of dentures. If carried out appropriately, it can even eliminate denture mobility completely. There is also the other group of patients missing one tooth or several teeth but not all. This case is referred to as partial edentulism. Our dentists have undergone special training to handle these patients. For anyone to benefit from dental implants, regardless of the number of missing teeth, there must be evidence of enough bone height and bone thickness. The choice of dental implant treatment largely depends on the number of missing teeth. In a case where the patient is missing all teeth, there are three major options to consider. There is the possibility of installing of 2-4 implants subsequently supported by retentive anchors. This allows the complete denture worn by the patient to snap into place. The other possibility is having more than 5 implants. In this case, a porcelain prosthesis is cemented on the implants, thereby creating firm, permanent results. ‘All on 4’ dental implant is another alternative that is gaining traction amongst people missing all teeth. We use it to restore full dentition in just 4 implants. For patients missing one tooth or couple of teeth, we can place dental implants in the location of each missing tooth. In other instances, we can use a few implants to serve as anchors for a missing set of teeth. The benefit of dental implants is that they preserve the integrity of adjacent teeth. Should there need to perform any operation on the adjacent teeth in future, the processes can be carried out without interfering with the plants. For the best dental implants Los Angeles services, get in touch with us today!